In Manhattan, the life span of a industrial building goes something like this: factory, rental apartments, condos. Sometimes there is a co-op stage in between. The Shephard, a collection of 39 luxury condos at 275 West 10th Street is a microcosm of that story. In the 1970s, 275 West 10th Street was transformed from a modest warehouse into 145 cheap rentals. In 2014, the Naftali Group and Starwood Capital bought the building for $68.2 million, and now luxury condos in the building are finally hitting the market, ranging in price from $1.7 million to $29.5 million. We toured the 12-story redbrick and granite building with Alexa Lambert of Stribling and Matt Van Damm of Naftali for the latest installment of our Big Open House series to see the evolution of the building ourselves. The building’s lobby is inspired by a carriage house and entered through large casement-style doors. It comes decked out with oak plank flooring inlaid with custom tiles, a bronze reception desk and a cozy fireplace. The space looks over the building’s private garden. Construction began on the building around two-and-a-half years ago, and it’s slated for an early summer completion. “We took everything down to the studs,” Van Damm says. Residence 6D is on the market for a pinch under $12 million, and the 3,805-square-foot pad served as our peek into the building. We’re told that the developers approached the design of the building more like an single home, rather than a traditional multi-unit development — something they say has resonated extremely well with buyers. The building is now over 50 percent sold. The large open-plan living and dinning areas come with vaulted ceilings, herringbone solid oak floors, and new — but Landmark Commission approved — arched windows. According to Van Damm, the age and location of the building drove the design, and the pieces that were chosen to stage the unit are either custom made or vintage — a little like the building itself. The art throughout the building all comes from the artists at Creative Growth, a Californian arts center, which sponsors disabled artists. The eat-in kitchen is designed by Gachot Studios and boasts solid mahogany cabinetry built by Smallbone of Devizes, custom hardware, a white marble island, Miele appliances and black granite work surfaces. A large pantry with pocket doors leads right back to the entrance foyer. The unit contains four bedrooms proper, but one of them currently serves as a library. The sprawling master suite comes with two walk-in closets and a master bathroom with white-fan-tile mosaic-marble floors. Beyond the residences, the Shephard is delivering some pretty impressive amenities. 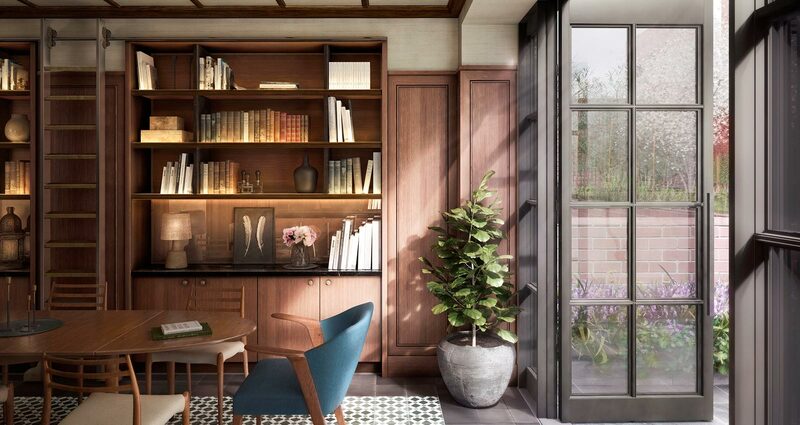 A mahogany-paneled library is right off the lobby and opens into the garden. But the really great stuff is in the basement. There you’ll find a game room, spa, screening room, golf simulator, wood-paneled gym, indoor half-basketball court, and bouldering wall for climbing. Nestled close to new and glitzy buildings like 150 Charles Street and the Richard Meier-designed 165 Charles Street, the historic and diminutive Shephard feels as if its always been a part of the neighborhood — and in a way it has.